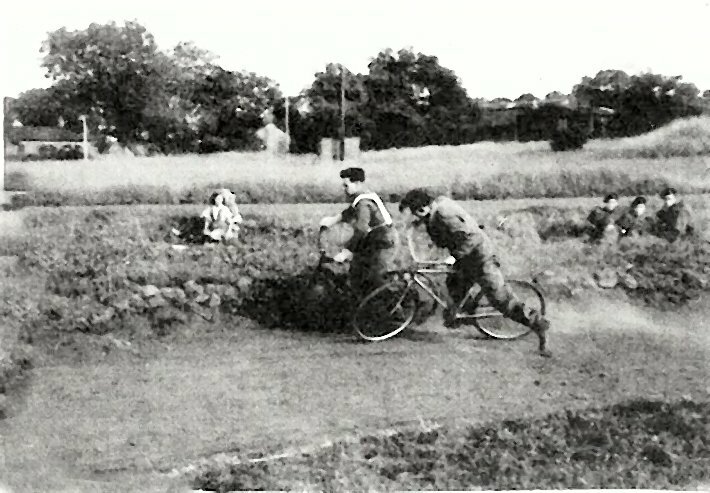 Following the end of World War 2, National Service for men aged 18-mid 20s was compulsory. 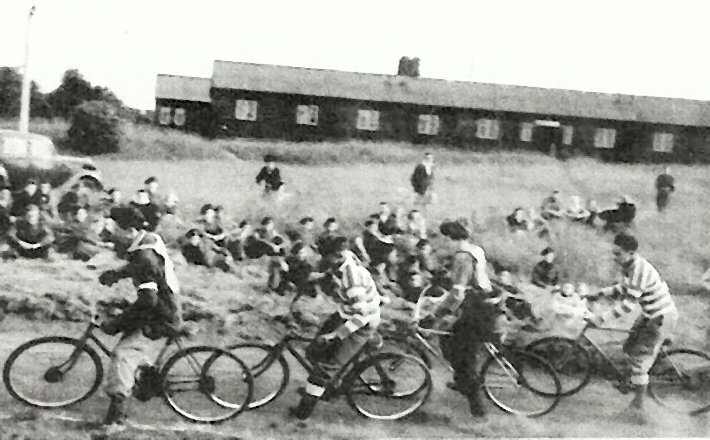 Many of those who were chosen for army service ended up Catterick Camp in North Yorkshire. 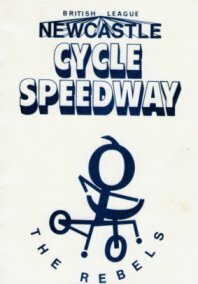 Some who did had ridden cycle speedway. 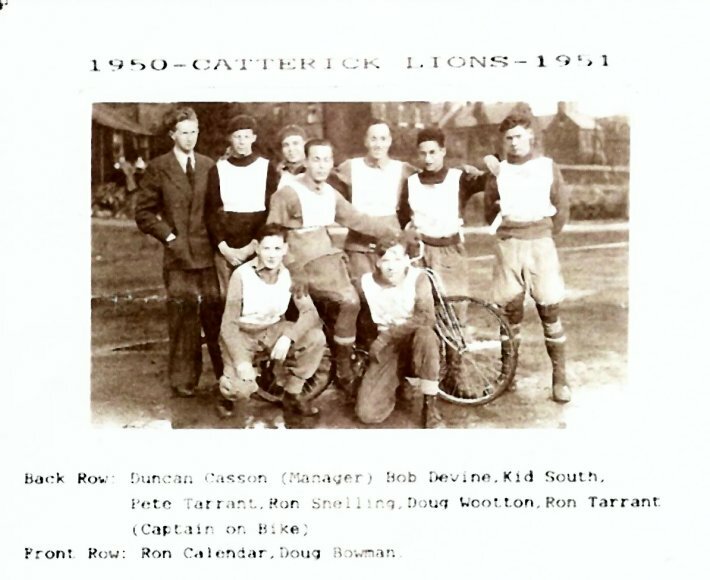 Ron and Pete Tarrant from Warwick, Eric Ashley from Norwich, and Bob Devine from Glasgow were all cycle speedway riders who met in 1950 at Catterick Camp and they decided to form a team to be known as the "Catterick Lions". Permission was granted to build a track with a red shale surface and concrete starting area. 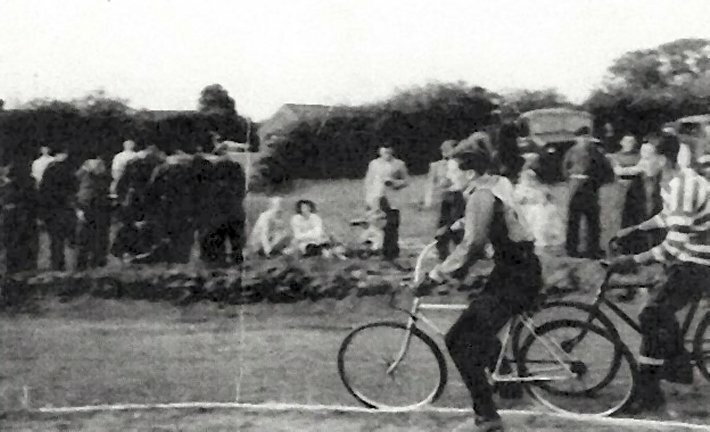 A starting gate was soon made in the camp workshops and it's electronics was controlled by a "borrowed" truck battery. 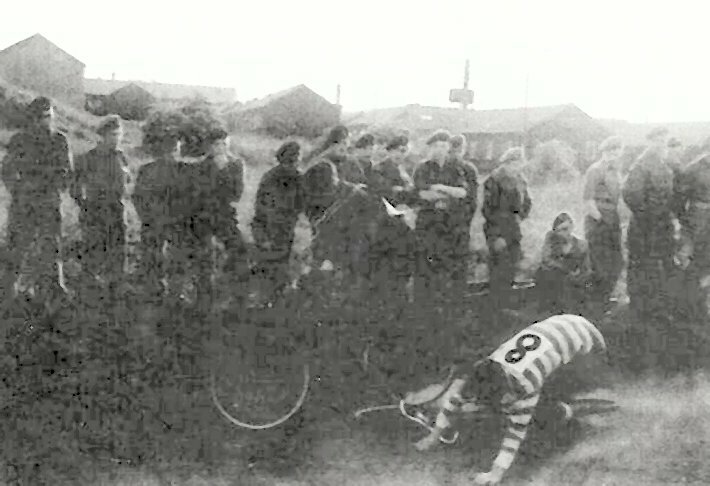 The first meeting was against the Newcastle team, New Brough Park Eagles and was held on 1st July 1950. 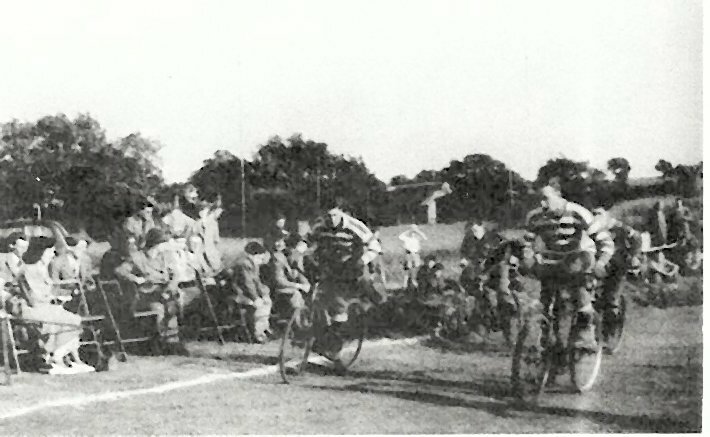 The Catterick side were successful, and on their travels, rode in Newcastle, Edinburgh, Glasgow and Bradford travelling by train with their bikes in the luggage carriage. We are concerned here with Catterick's matches with Newcastle, and we are aware of the following results. 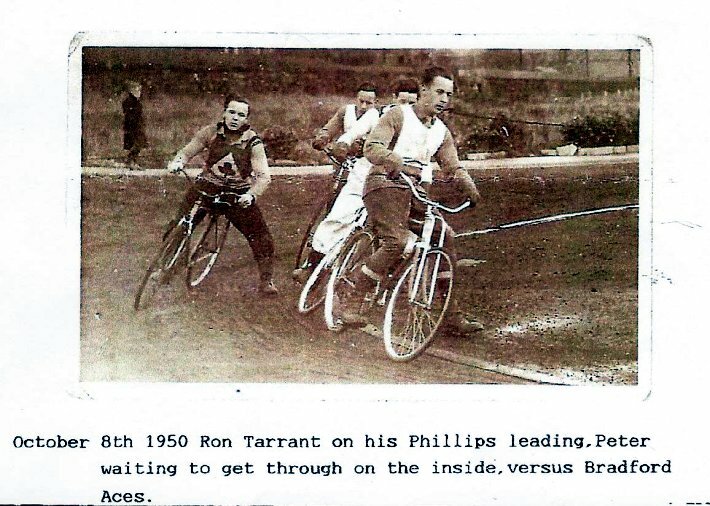 The very first meeting 1950, at Catterick resulted in a win for them, over the New Newcastle Eagles 56-40. 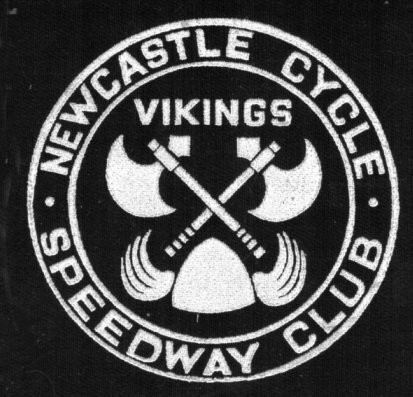 The Newcastle team was Ernie Hodgson 11, Arch Cooper 8, Derek Alder, Bill Harvey, Bill Miller, Derek Barras and Norm Carney. 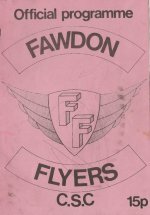 Catterick visited Newcastle for the return meeting on the 1st Aug 1950, beating the Eagles 59-39 and 31-24 against the "Flyers". 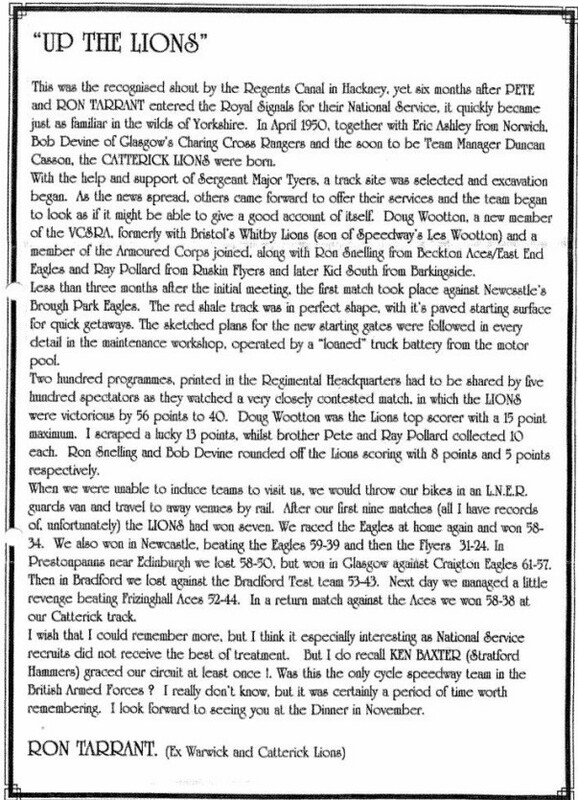 Norman Whitfield now living near Glasgow, who has been a great help in giving us information of the early years he remembers riding in Newcastle against a "Select" side. 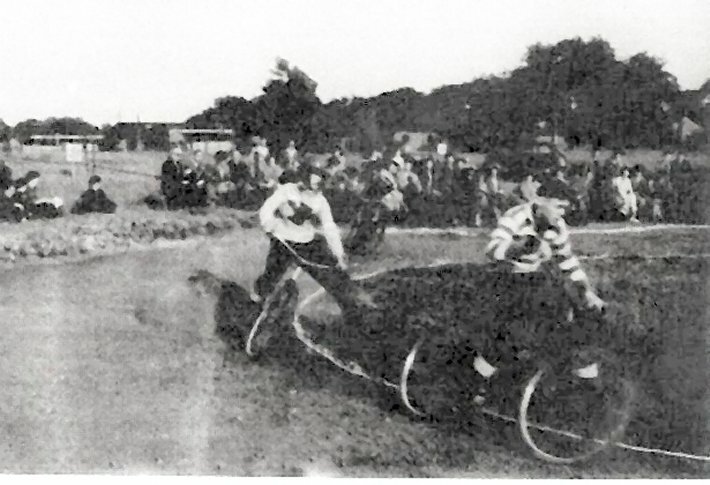 The Eagles as well as riding in the opening meeting, returned on 23 July 1950 and rode a 9 heat meeting in very wet conditions, Catterick winning 27.5-26.5. 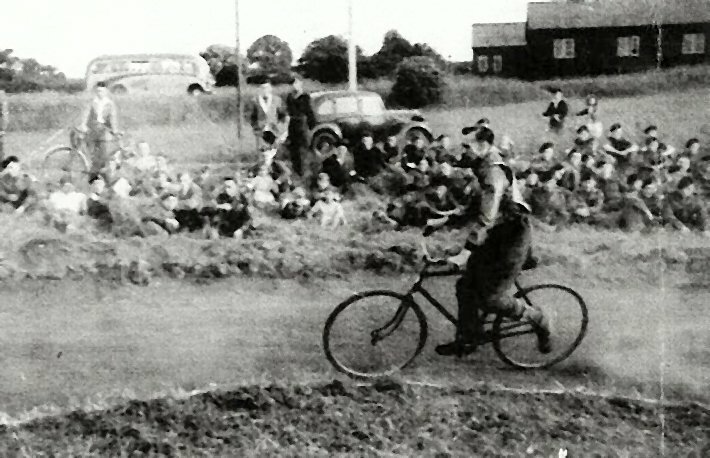 On 29 July 1950 the Eagles once more travelled down the A1 to Catterick camp again losing to the Lions 58-34. 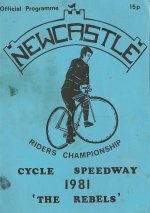 The Newcastle team was the same as the week before with the addition of Jackie Hiscock at reserve. 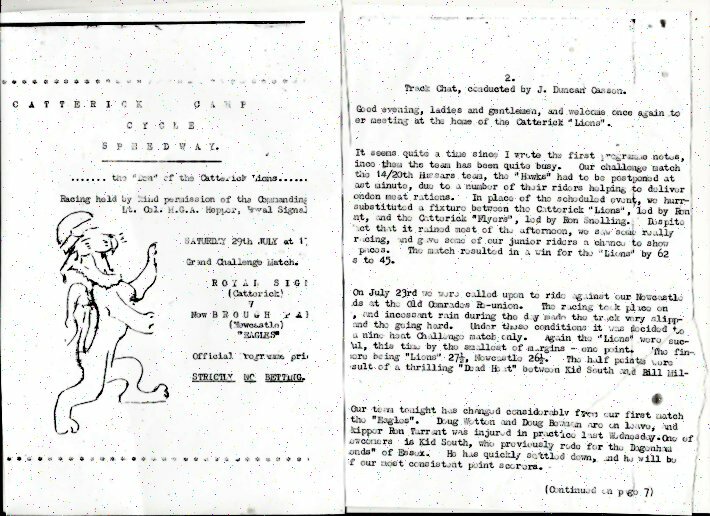 Norman kept a copy of the programme and I have shown it further down this page. 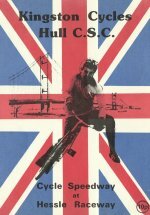 Jackie Hiscock was the "adult" in charge when we tentatively started up again in Newcastle in 1965. 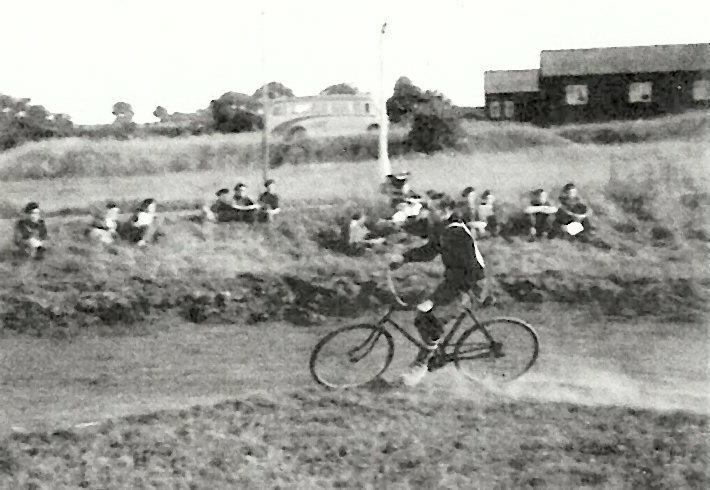 He has also supplied photos from Catterick. Unfortunately teams and riders are unknown. Thanks to Norman Whitfield, Ron Tarrant, Bob Garland and Jackie Hiscock. Archie Cooper who rode at Catterick for the Newcastle Eagles has been in touch. He has recognised himself in the photos, so we can confidently assume the photos were from a Catterick Lions v Brough Park Eagles match. Les Gustafson (from South Shields) has spoken to Doug Wotton (80) who rode at Catterick. He remembers riding there in 1951. No 8 has either fallen or is praying to Allah! 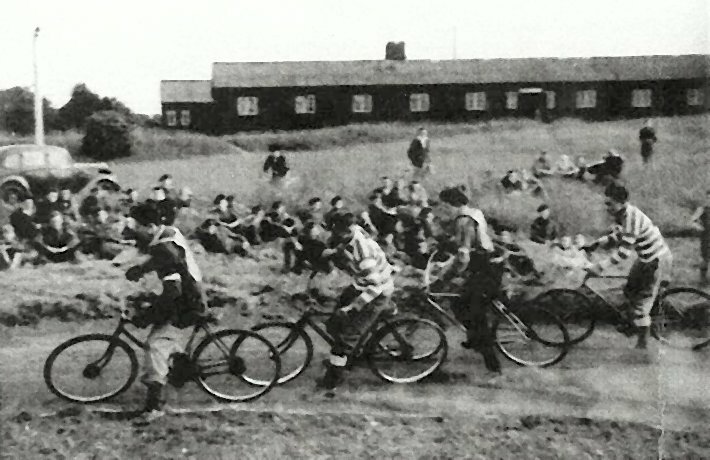 A good photo showing Catterick Camps spectators, all in their army uniforms. 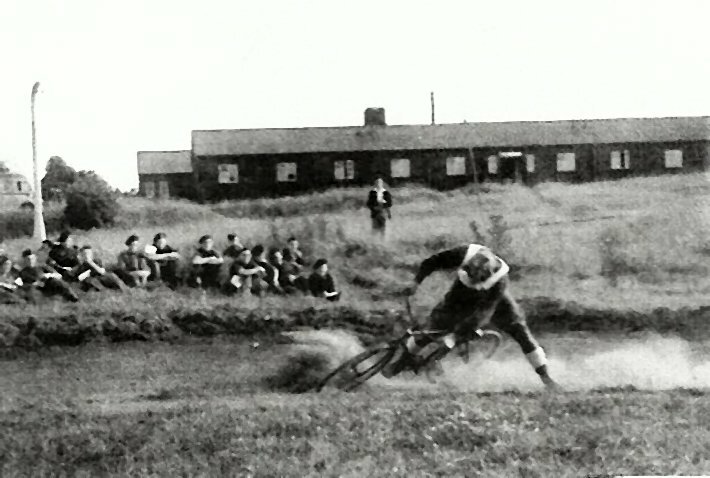 Two more photos from Catterick, an interesting team shot and a fine action photo. 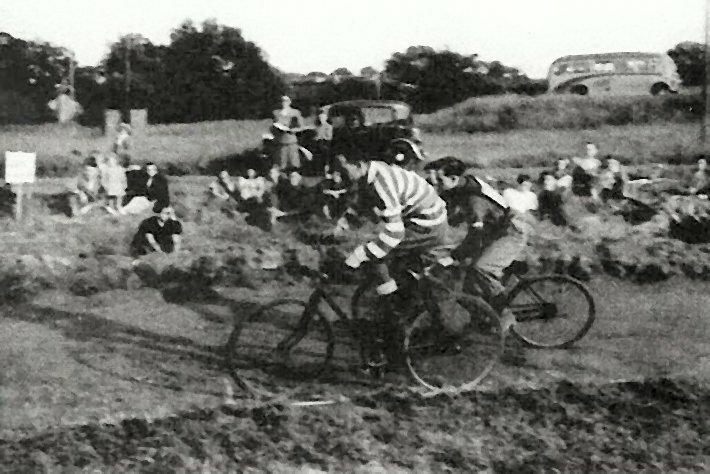 An article in “Track Record”, the quarterly magazine of the Veteran Cycle Speedway Riders Association, has reconfirmed that the above photograph is of one of the heats in Catterick Lions’ victory over Bradford’s Frizinghall Aces during their visit to the city in October 1950. 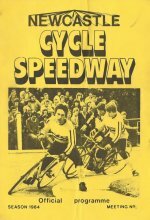 The score was 52-44 and the track was in Shipley, in the northern part of Bradford. South Shields' Les Gustafson has provided the above photo of Doug Wotton after he returned home after his National Service. 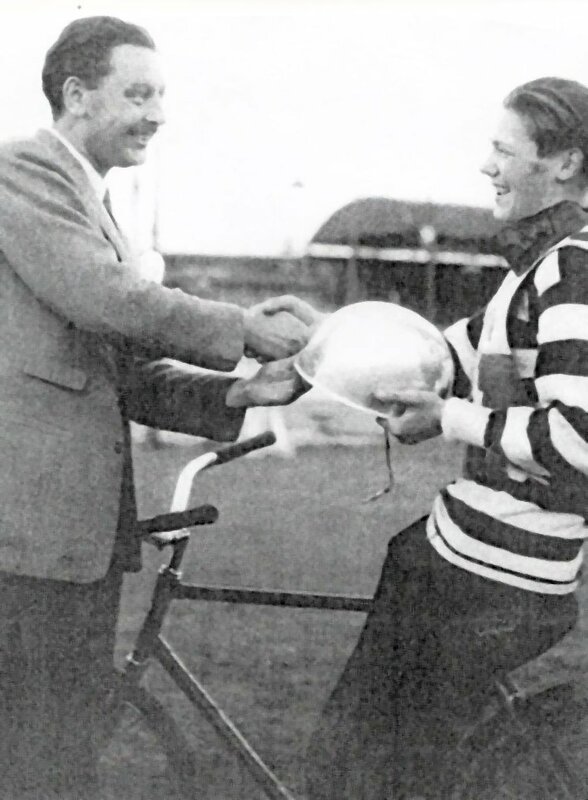 He was riding for Bristol Whitby Lions in 1952 when he was presented with the trophy for being the Somerset Champion. 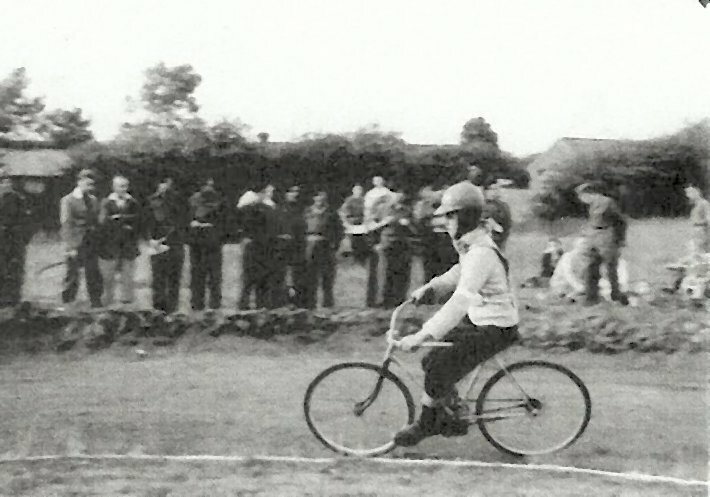 Doug Wotton is credited with the Catterick track record – 52.2 seconds. For a 73-yard track (according to old match reports) this appears on the slow side (race timings at Temple Park were about 50 seconds for a 90-yard track, for example), but the clue may come from reports that the track was surfaced with cinders from the Camp’s boiler house, and may have been much deeper than modern-day circuits. 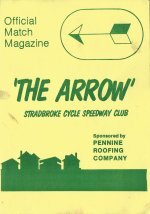 Les Gustafson has also provided more information about the Catterick v Brough Park Eagles meeting mentioned above. 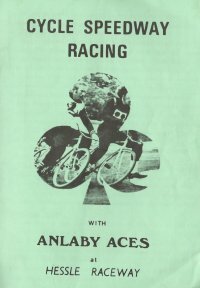 The following was found in Sept/Oct 1950 edition of the Amateur Cycle Speedway magazine. We now know that the Newcastle Eagles tracked an eight man team, as above with the addition of Jackie Hiscock. The Steward was Newcastle official E Hodgson (Sr). The crowd was said to be around 500. Les has spotted the Catterick team and riders totals do not agree. He suspects there was confusion with the Tarrant brothers rides and scores. The same magazine reported in the Nov/Dec 1950 issue two results from meetings in Scotland. Edinburgh Select 58 Catterick Lions 50. Les Gustaffson has come up with the following items. 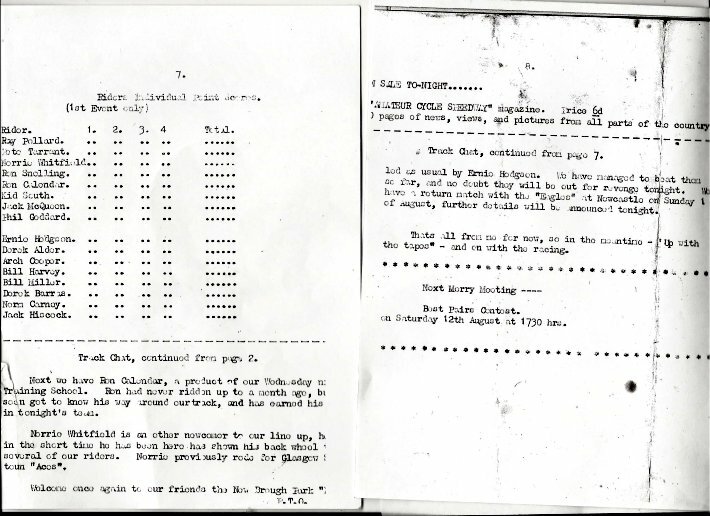 Les Gustafson says: Ron Tarrant, who subsequently emigrated to Canada, contributed an article some years ago to the VCSRA 'Track Record' magazine and has also supplied a copy of the item in the national magazine from which he drew some of his information. 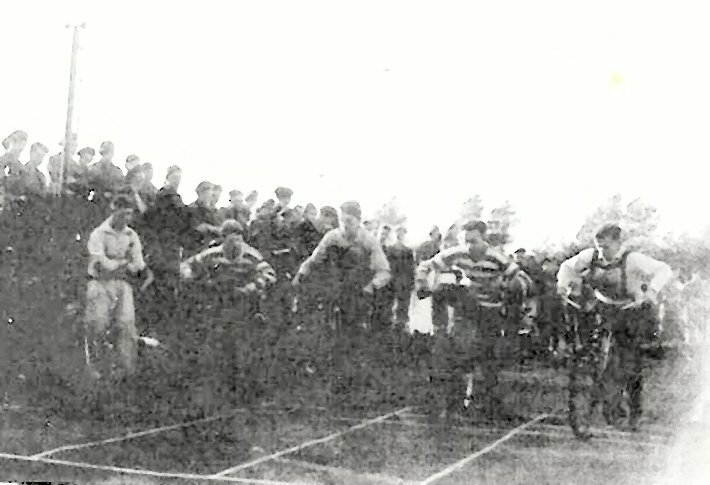 He also confirmed that the Catterick side raced a second match during their visit to Bradford - losing against the Bradford Test team 43-53, and then hosted Frizinghall in a return match, winning 58-38. 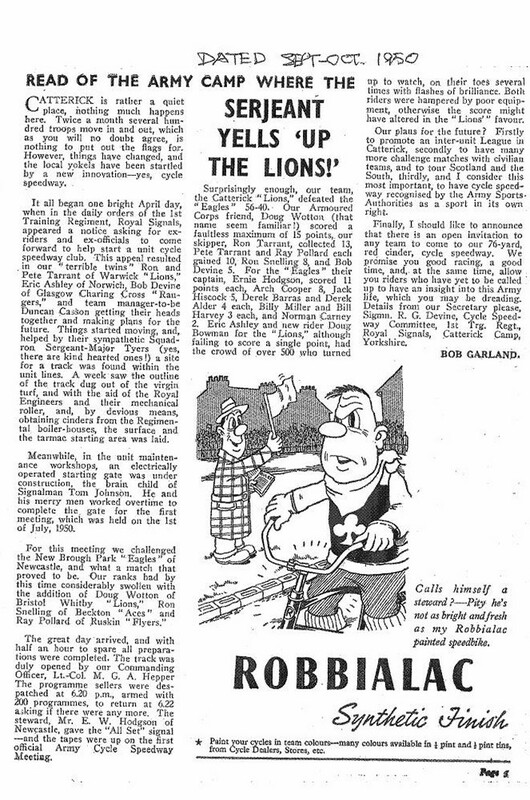 Les Gustafson says: A summary of the 1950 season gives a record of ten matches between July and October - four against Newcastle (two home and two away), all won by Catterick, including the one abandoned after only nine heats due to bad weather with Catterick ahead 27.5-26.5, three against Bradford - home and away wins over Frizinghall and a 43-53 defeat away to the Bradford Test Team - plus a win in Glasgow and a defeat in Edinburgh. The other match was a scratch event - Catterick Lions v Catterick Flyers, won by the Lions 31-24(?). 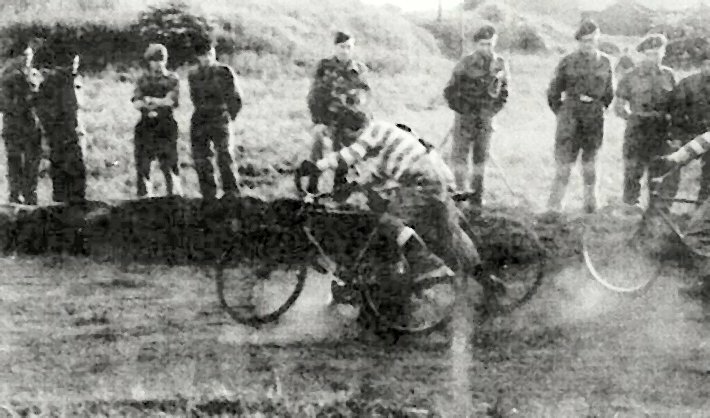 There was nominally a Catterick Hawks side, but no report of racing. 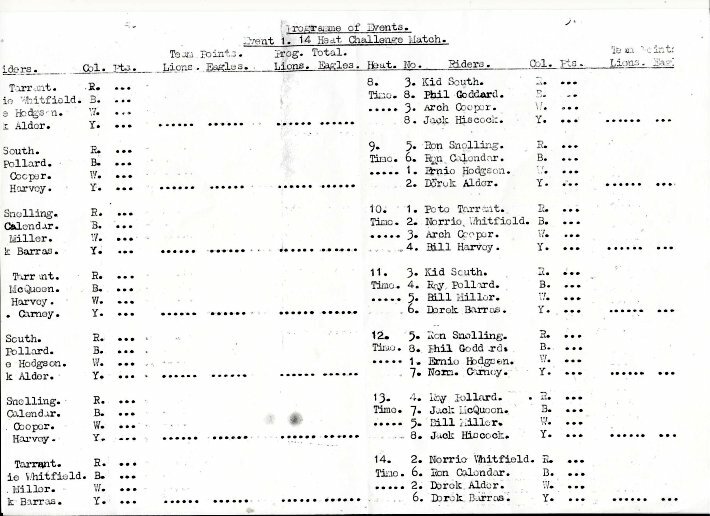 An eleventh fixture - a Best Pairs in August 1950 - was scheduled but no record of the event has surfaced. Copyright © 2011 Keith Dyer. All rights reserved. 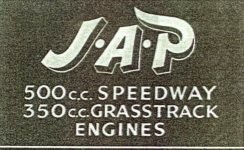 Advertisers / sponsors are welcome on this site. email for the price.